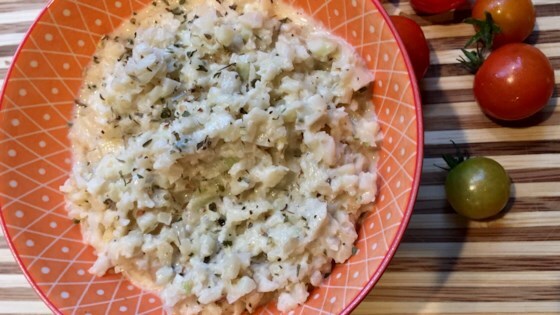 "Mushrooms, cauliflower, heavy cream, and Parmesan cheese combine in this creamy low-carb risotto, perfect as a side dish or even as a main dish." Melt ghee in a skillet over medium heat. Add onion and garlic; cook until tender, about 3 minutes. Stir in grated cauliflower; cook for 3 minutes more. Add mushrooms and cook until tender, about 3 minutes. I used a bag of frozen riced cauliflower. This was easy and good! My friends really liked it too. No changes, I made it as is and it was delicious. This was unbelievably good! We are making it again for friends just days later! I added extra veggies and more seasoning, definitely a keeper to use again. Absolutely divine! I used butter instead of ghee, and one large shallot instead of onion. I also cut the parmesan down to 1/4 cup and it was delicious. Even my kids enjoyed it.